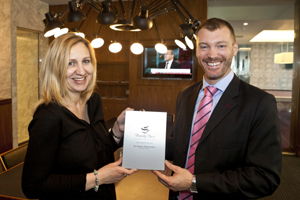 Gatwick North's No.1 Traveller airport lounge has won an award for providing the world's best business facilities. The Priority Pass Lounge of the Year Awards were voted for by members of independent airport lounge access firm, Priority Pass. The Gatwick lounge beat off competition from over 600 airport lounges and received 40,000 ratings from Priority Pass members. The lounge’s facilities, including a travel spa and business centre incorporating private meeting rooms, printing, scanning and faxing facilities and free wi-fi and internet terminals. Jonathan French, Priority Pass’s head of brand, said: "To be voted as having the best business facilities in the world is a great reflection of how hard No.1 Traveller airport lounges work to support their customers. With international business travel now a significant part of our lives, it is imperative that we offer Priority Pass members the best options to balance work and travel." Michael Robey, No. 1 Traveller’s head of experience, added: "Business passengers represent a significant proportion of the guests we look after in our lounges, and, as such, we are committed to ensuring our facilities meet their needs and allow them to keep working on the move.